Time To Pet has built in support for tipping. 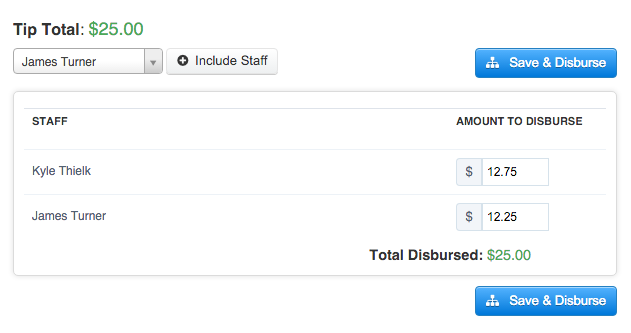 Tips can be added to any invoice from both the admin dashboard and by your clients when they are paying an invoice. Tips can easily be added to any invoice. Locate the invoice you want to add a tip to and click the Edit link. Set the tip amount desired and click the “Save Tip” button. 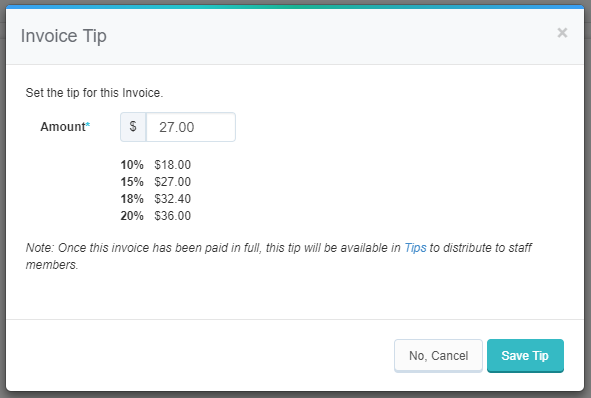 Once a tip has been set on an invoice, it can easily be modified. The “Add Tip” button will change to “Edit Tip”. Clicking this button will launch the same window where you can then edit the tip amount. In order for tips to be payable to your staff they have to be disbursed. An invoice can often have multiple services which can be assigned to different staff members. Disbursing tips allows you to divide and distribute these tips to the appropriate staff members in the appropriate amount. Note: Tips are only eligible to be disbursed once the invoice has been paid in full. Important note: Terminology may differ depending on if you have Contractors or Employees selected in your Company Settings. The verbiage for Independent Contractors is Invoices and the verbiage for Employees is Pay Stubs. This article will use the Employee terminology (Pay Stubs). Navigate to Staff -> Pay Stubs. All tips available for disbursement will be listed in Non-Disbursed Tips. Click the “Disburse” button for the tip you wish to Disburse. A new window will appear with all staff members that are assigned to one or more visits in the invoice. Their allotment of the total tip will automatically be calculated based on their percentage of the entire revenue for the invoice. Each staff member’s amount can be manually adjusted, but the total cannot add up to more than the total tip available in the invoice. To add a staff member that was not part of the original invoice use the “Include Staff” button and the staff selector to the left of it. When ready, click “Save & Disburse”. The Window will close, and that tip will disappear from the “Non-Disbursed Tips” table. It will now appear in the “Disbursed Tips” table. Once a tip has been disbursed, it is now ready to be paid out to the staff member. If a staff member has a tip balance, we will display this in their profile. Generate a pay stub for this staff member (the date range is irrelevant, the next generated pay stub will automatically include the entire tip balance). The entire tip balance will be included on this pay stub; however, it can be manually adjusted if only part of it should be paid out now. The staff member’s tip balance will be adjusted by the amount paid out in the pay stub. * Due to limitations with Quickbooks if your account is linked to QB and the invoice already has both a discount and sales tax it will not be possible to also add a tip. Once the tip has been disbursed, the staff will be able to view the amount they received and the client who sent it. They can view this information in the My Pay > Tips section of the dashboard.